The Ultra Maxi SF's weight might not make your eyes water, but its price will. Even if you shop around, you'll be doing well to get this miniature marvel for less than £60. At that price, it's really got to do something special to earn its keep. It's certainly small, though it'll still require a medium-large camera bag. However, it will slide neatly into any backpack. The impressive maximum height is achieved using four-section legs using clever (in theory) twist grips on the top and bottom leg sections which unlock/lock all four sections at once. This isn't as easy as it sounds, though, and the legs on our tripod were prone to jamming or sliding (the legs would slide back in when we thought we'd got them locked). This slows you down and erodes your confidence in its load-bearing abilities somewhat. Our Ultra Maxi SF came with a ball and socket head, though there is a variant with a pan and tilt head. The ball and socket worked well enough with lightweight cameras, but its ultimate 'grip' when locked wasn't strong enough to prevent some movement if you gave the camera a firm push. Actually, though, given its tiny dimensions the Ultra Maxi is much more rigid than you might expect. 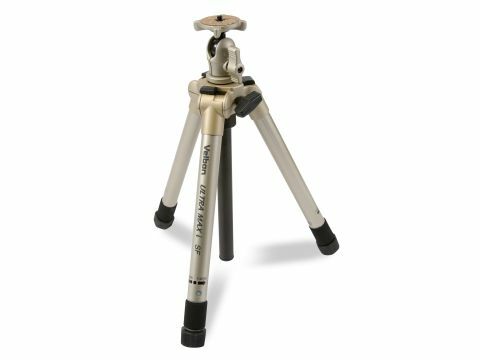 It's not the same as a 'proper' tripod, but it's better than the Slik U6600, for example. It's the price that puts us off. "Hmm," you think when you first set it up, "it's fiddly and plasticky maybe, but not bad for a cheap tripod". But of course it's not cheap. Quite the reverse. Ideal for the backpacking photographer, though.